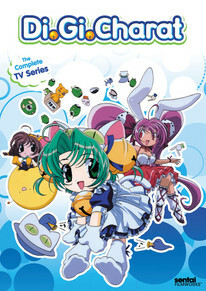 Dejiko is a perfectly normal princess from the planet Di Gi Charat, who arrives in Tokyo with dreams of becoming an idol. Unfortunately, girls with cat ears and a tail and who can shoot ray beams out of their cat eyes aren't exactly what most prospective employers are looking for. But there's one place where Dejiko does fit in perfectly: Akihabara, where a kindly game store owner offers a job to Dejiko, her sidekick Puchiko and their balloon-like protector Gema. But things still aren't going to be simple, as Dejiko's bunnysuit clad rival Rabi-en-Rose wants to become an idol too. And when the notorious Black Gema-Gema Gang, led by Princess Piyoko of the planet Analogue, lands in Tokyo, it will be all Dejiko can do to keep up with Piyoko's nefarious plot of opening a rival game store across the street! (She's kind of on a budget, since her parents spent all their money unsuccessfully trying to take over Di Gi Charat.) Can an interstellar cat princess really find happiness on Earth in the music industry?